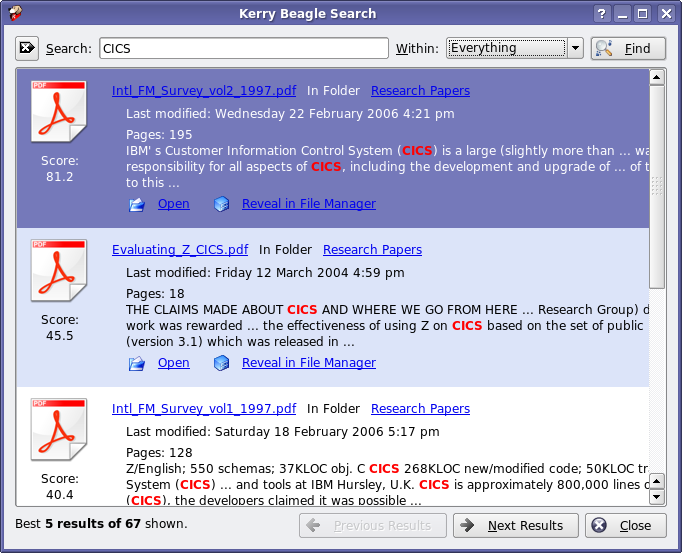 A few weeks ago, I installed Beagle, a desktop search tool written for Mono, and it's KDE front-end Kerry. This combination has just blown me away. I guess desktop search is like the microwave oven, cell phones, and the internet - it's hard to realize how truly useful it is until you've gotten used to it. I know I didn't. But so far Kerry-Beagle has saved me lots of time searching through those hundred-odd PDF files I've been using for research. Now that I'm used to it, I don't think I'd want to do without it. My only other desktop search experience is with the (apparently now defunct) Kat desktop search application for KDE, which never really worked very well for me. I guess now I'll have to try out some of the Windows offerings. Anyone have any suggestions on which are the best packages? Enter the difference of 4 and 86.